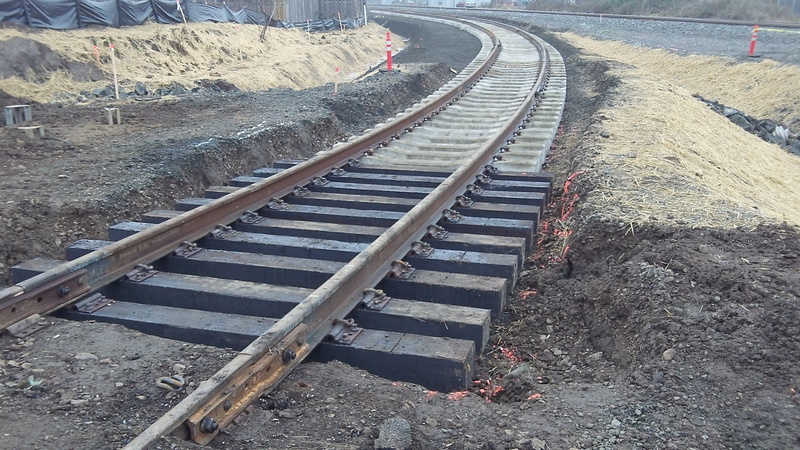 A section of new track on the east side of Madison Street. 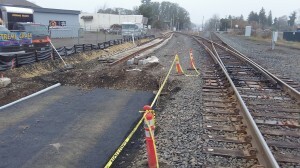 Looking east from Main Street: Where the new track will go on the left, and the UP mainline on the right. The deadline for finishing this Albany railroad project has been missed, but there’s been a lot of progress lately, including the partial installation of some actual track. 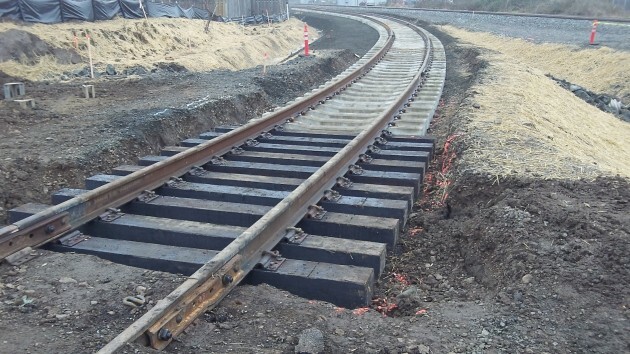 The Portland & Western Railroad has been building what’s called the Santiam Lead, a section of track that parallels the Union Pacific mainline for about three city blocks. Under the “ConnectOregon II” grant program, ODOT-Rail is contributing just under $7 million to the project, which has a budget of $8.7 million and, according to the latest extension, was to have been completed by Dec. 31, 2013. But if the work can be accomplished within 90 days after the deadline, that’s OK with the state. The new track will allow P&W freight trains coming across the Willamette River to turn left toward the Millersburg yard without entering the UP mainline and thus having to wait for an OK to proceed. The change is supposed to enable the company to move more of its switching and train building from the Albany yard to Millersburg. That in turn will reduce blockages of the Queen Avenue railroad crossing. The new rail bed from Santiam Road to Madison Street has been prepared, and rails and crossties have been installed near Madison Street. Near Main Street, rails and ties have yet to be laid down.